All your outdoor gear is as good as you take care of the gear and the sleeping bag is no exception. Treat your sleeping bag well and your sleeping bag will treat you well. The storage of a sleeping bag is very critical regarding the life of the bag. Never keep the sleeping bag squished in a stuff sack for extended periods of time because the loft of the bag (either down or synthetic) will not spring back to its original condition. 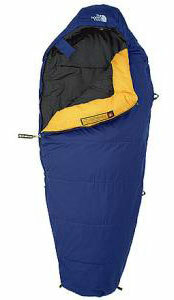 Always either hang the sleeping bag up or place the sleeping bag in a large bag that lets air circulate through it. Always read the instructions that come with your bag (might be on a tab attached to the bag). If the instructions can't be located, contact the manufacturer directly. The sleeping bag can have the loft restored temporarily by placing the sleeping bag in a dryer and setting the temperature to low heat for about 10-15 minutes. Always check to make sure the bag is not too hot as high temperature will ruin the sleeping bag. A clean tennis ball placed in the drier with the sleeping bag will help to restore the loft. Never take the sleeping bag to the dry cleaners as the chemicals will damage certain types of fill used in the sleeping bag. Always use both zippers (if two are present) to zip up the sleeping bag. Zip one zipper half way to meet the other zipper half way. That is why 2 zippers were included with the bag. Never use a top-loading washing machine to wash the sleeping bag as there is a good chance that the sleeping bag will be ripped and shredded. Always use a front-loading washing machine. Set the machine to the lightest, gentlest setting. Use only a non detergent soap especially made for a sleeping bag. The use of a incorrect soap will ruin the performance of the sleeping bag. The sleeping bag can also be washed by hand in a bathtub half full of warm water and the appropriate soap. Just knead the sleeping bag to clean it (don't tug, pull or lift up the sleeping bag). Let the water out of the bathtub, but don't lift up the sleeping bag. Turn on the shower with very warm water to try to get out as much soap as possible. Press down on the sleeping bag to get rid of all the excess water. Place a large bath towel underneath the sleeping bag to lift the bag out of the bathtub. Do not lift the sleeping bag by itself when it is wet as it might damage the inside of the bag. Mat the bag with the large towel and place the sleeping bag into dryer. Place one or two tennis balls in the dryer to fluff up the loft. Set on very low, gentle heat and make sure the dryer does not become too hot. When hiking, kayaking, etc., always store your sleeping bag in a waterproof compression sack to keep the bag dry. A little precaution in the beginning will save a lot of maintenance later. Always carry a sewing kit, extra zippers, duct tape, etc. to help make minor repairs to the sleeping bag. The simplest repairs can be made to the bag, but without the proper repair gear, it won't be possible. Have fun backpacking and don't forget to take care of your sleeping bag when you return from your hike.